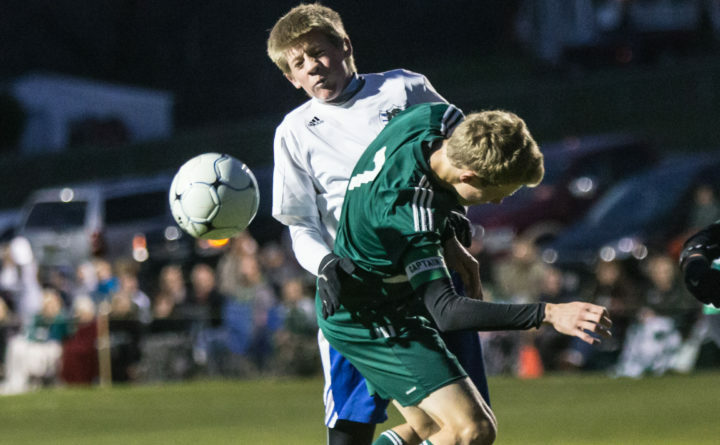 Brad McKechnie (foreground) of Penobscot Valley High School, pictured during a game in 2017, was among the players who helped the team win the Class D North championship this season. North Yarmouth Academy beat the Howlers 3-1 in Saturday's state title game. Damon Dulac connected for second-half goals only 1 minute, 36 seconds apart on Saturday evening, giving North Yarmouth Academy the boost it needed to post a 3-1 victory over Penobscot Valley in the Class D boys soccer state championship game at McMann Field in Bath. It was the sixth state title overall for the Panthers, who won for the first time as a Class C competitor. North Yarmouth Academy, coached by Martyn Keen, completed a 16-2 season in taking its first state crown since 2005. The North champion Howlers from Howland faced an uphill climb against the Panthers. NYA racked up a lopsided advantage in shots and corner kicks. Coach Jeremy Durost’s Penobscot Valley squad closed out the campaign with a 16-2 record. The Howlers received a 17-save performance from goalie Elijah Wood. The Rangers also received a goal from Ryan Baker. Despite being outshot 10-0 during the first 20 minutes of the game, it was Penobscot Valley that broke a scoreless deadlock. Alex Tash managed to get off the Howlers’ first shot of the contest. It caromed off the crossbar and landed at the feet of Grant Kidon, who booted it home to make it 1-0 with 14:36 remaining in the half. They would be the only shots PVHS would muster over the course of 80 minutes. It took NYA a little less than 10 minutes to put one on the scoreboard. Baker scored on an assist from Alasdair Swett, beating Wood to the opposite side of the goal with 5:10 to play in the half. Despite the field being tilted in the Panthers’ favor, they did not take the lead until the 20:59 mark of the second half. This time, Dulac fired a long shot toward the goal that a defensive player failed to handle and it also eluded the goalkeeper. Only 1:36 later, NYA’s persistent attacking paid dividends when Dulac buried a shot from inside the penalty area to make it a 3-1 game.